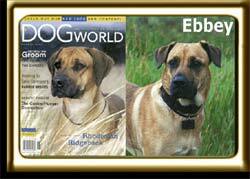 The August 2001 cover of Dogworld (upper left photo) shows a purebred black muzzled Rhodesian Ridgeback. Though Ebbey's true ancestry remains unknown, her appearance and personality are very characteristic of this breed. Ridgebacks are named after a backwards growing ridge of hair along their back. Some Rhodesians have a black muzzle and light to reddish wheaten body (upper left photo), while others are almost entirely wheaten or liver colored (4 month old pup > ). This purebred ridgeback pup named Sophie was born ridgeless. Since this limits her monetary value, she was given to the pound at 8 weeks of age. What is Ebbey crossed with? Your guess is as good as ours. With her friendly disposition and allergies, she could be crossed with a yellow Labrador retriever. Knowing nothing about ridgebacks, owner Allex Michael did some research. Bred to hunt lions, ridgebacks are scent and sight hounds. The breed was developed from a semi-wild African dog (Ebbey's wild), bred with imported mastiffs (Ebbey's black muzzle), bloodhounds (Ebbey's intense tracking and loose throat), pointers (Ebbey points) and greyhounds (Ebbey's fast). Great danes and bulldogs may also have been in the mix.